I caught the tail end of BBC Breakfast this morning and they were discussing blogs. What are they, why do people do it, how it’s a fad with the average blog lasting four weeks and then the ultimate comparison – it reminds the presenter of CB radio a few years ago. While I thought the piece was biased towards the technically ignorant (non geeks) it did get me thinking – why do I do it? It’s certainly not because I think I’m a journalist – far from it, although the fact that many sites think blogs are replacing news agency’s has got the traditional news sites in a bit of a tizzy. BBC themselves are running a survey on blogs and journalism that is showing just under a quarter believe that blogging is journalism. BBC nail their colours to the mast stating the findings of another survey cut through ‘blog hype’. The hype is really from mainstream media so it’s good to see them dismiss their own reports. While I’ve drifted onto this, an example of two cracking sites that have highlighted issues on the middle east crisis that I would have missed if it hadn’t been for blogs. 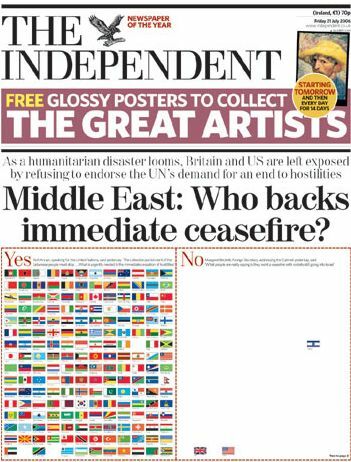 Firstly, Kottke posted an image from the Independent that summed up world opinion in an instant (reposted below). Secondly, this site has been keeping a Google Earth kmz file up to date with positions of all the atrocities in the current crisis alongside media cuttings of what happened. Anyway – back on topic. I don’t blog to get readers either (just as well). I am interested in people who do visit and where they came from (thank you Mint) but I’m not motivated by how many 100’s visit, employing search engine optimisation techniques or indeed getting loads of good page rankings and then adopting some Google ad’s – just not me. The first reason I started was down to having a ‘can I do a blog’ niggle. It lasted a while before I eventually got up and running. I eased into geek ramblings and non personal postings as it was easier and to this day the blog is still very impersonal. I also had a feeling of giving something back. I’ve learned so much from reading other blogs whether it be personal experiences, tech opinions or just ramblings that make my day a little easier to get through and from time to time I might offer something that someone might gain from. The second reason was to have some sort of journal that I could look back on. It’s not turned out the way I wanted but I do have around three years worth of postings, links and comments that I do occasionally look back on. Ideally it would have been more personal and also had some work related ramblings but that isn’t worth the hassle it could potentially cause. There have been downsides. A feeling of ‘I have to post’ has got me a few times as well as ‘time to shut this down’. I’ve also received a few nasty comments especially during this years World Cup…the English really do have a problem with people not supporting them especially Joe who’s worthy contribution was ‘Die you Scottish Prick’. Nice. I do edit crap like that out of my blog as I just don’t want to read that again in a few years time. All those are outweighed by the genuine people who do frequent, the occasional really nice comments and mails that are left, the invites to closed beta’s (Diigo being the latest and also one of the more impressive apps I’ve used recently. Turbo charged bookmarking and social commenting and if you want an invite I do have some at my disposal – full write up soon.) and the ability to keep in touch with real world friends through postings, pictures and comments. Nice. It’s also fun…usually. So it’s two fingers to those who sneer at blogs in general – this is one that won’t be disappearing. Neither will blogging disappear. A blog allows a person to become their own media mogul, linking to anyone in the world (if they choose to) and allowing anyone worldwide to read their posts. Who would have thought years ago that from your own home you could post real time news, have people easily find the content, have discussions raging that are in your control, easily link to your own photo’s of the story, allow people to listen to your own podcast and broadcast video even if it is only through a webcam. Empowerment is a wonderful gift. In the right hands it can have a massive impact. In the wrong it can be dreadful. Instead visit 9rules to see some of the better blogs available for your consumption and see what empowerment really can deliver.